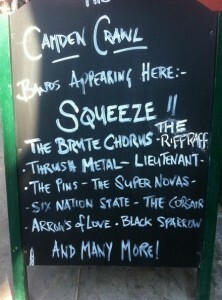 Squeeze to Crawl in Camden? 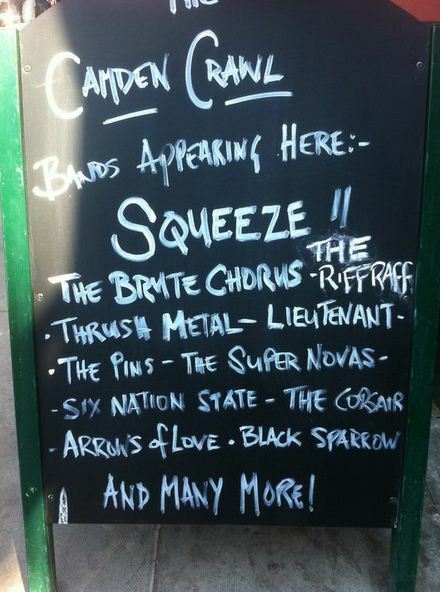 Will Squeeze be playing the Camden Crawl at the Hawley Arms tomorrow, Sunday 1 May? That’s what the sign says! Thanks to Snipturn for the info. 3 Responses to "Squeeze to Crawl in Camden?" Boy, I wish I’d known about it before the event! I don’t suppose there are any plans for another London pub gig? Also, what’s the best way of ensuring I don’t miss out on hearing about such events in future? Hi David – the best way to keep up to date with all the planned and surprise gigs is to subscribe to the RSS feed for http://www.packetofthree.com. Try it – and then you won’t miss out.